** Snob Hounds Home ** ... so unique as to put the snob in any hound! OUR NEW MORE USER FRIENDLY WEB SITE IS COMING SOON! We hope you will take the time to shop our current site until then. PLEASE CALL OR EMAIL IF YOU NEED ASSISTANCE. THINK OF IT AS CUSTOMER SERVICE, NOT VINTAGE TECHNOLOGY! As seen in Modern Dog Magazine Winter 2009-2010! Snob Hounds Donation Coats can help make your shelter or rescue group's fundraising efforts really pay off and help more dogs in the long run too! 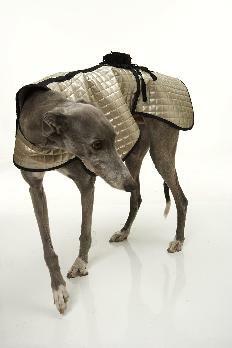 Snob Hounds lined Thinsulate Coats. Fashion, warmth and function all in one garment. New SPRING coats in pink, polka dots, distressed faux leather and fabulous quilting. 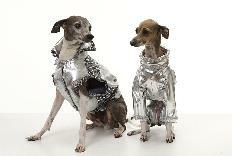 CoCo Coats in platinum and decorated denim. Speedracers in tattoo, op art and sculls fabrics. 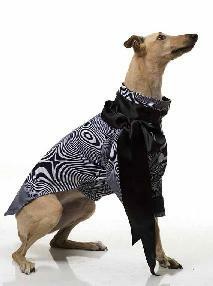 �Watch our site for the latest in hip pet fashion. New creations are continously being added to our site. Check back often to see what is new for the upcoming season! Browse through our 1", 1.5" and 2" collar collections, "Best in Show" collars, our exclusive Diva Shirts, PJs and accessories, along with measuring and ordering information. Our collars are continually updated and more patterns are coming soon! And wait until you see our newest additions in leather collars and leashes! Other new items include winter coats (both fur and fleece), rain coats, wet/dry coats, speedracers and additional accessories. 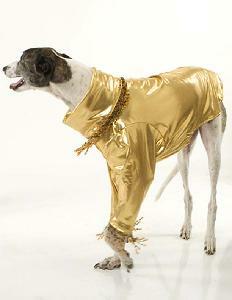 You're sure to find a style that will put the snob in your hound! GIFT CERTIFICATES are now available. Please contact us via phone or email (dionjones@aol.com) if you have questions about availability and ordering. We are now accepting PayPal payments! 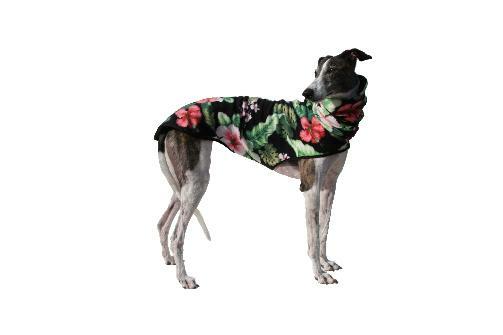 The Diva Shirt: A long-time favorite of the Italian Greyhound community, the diva shirt is now available through Snob Hounds in sizes to fit a variety of breeds. Let your favorite pooch make its luxurious statement in fleece and feathers. NOW IN BIG DOG SIZING TOO! Rhinestone Collars: Snob Hounds founder and partner Laura Dion-Jones originated our rhinestone collars years ago for her own beloved dogs. These collars feature Swarovski crystals, which are the same rhinestones found on the runways of Italy. They are now available for your own pups� adornment. Leather Collars: Are a wonderful addition to your hound's wardrobe. And they only get more supple with continued use. Currently available in a 1" and 2" slip collar and a buckle collar with co-ordinating braided leather leashes. Fabric Collars: Whether one of a kind or one of many, our collars are always on the cutting edge. They are sometimes seasonal, sometimes trendy, and always a unique look for your one of a kind dog (or cat). Pajamas:�Our deluxe-fitting PJs will keep your little one warm, comfortable and snugly even in the coldest of climates. They're made of the softest fleece and the weight of the fabric changes with the season. Our�merchandise is so unique as to put the SN*B in any hound. 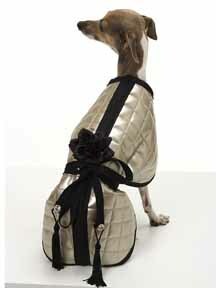 And a percentage of every Snob Hounds product goes to support Greyhound and Italian Greyhound Rescue.